River Valley’s Will Hash (left), Eastern’s Jayden Evans (center), and South Gallia’s Bryceton Folden (right) compete in the 100m dash, during the River Valley Open on Tuesday in Bidwell, Ohio. OVCS senior Trevor Blank finishes the 100m dash in front of SHS senior Weston Thorla, during the River Valley Open, on Tuesday in Bidwell, Ohio. BIDWELL, Ohio — The River Valley boys track and field team defended home turf against four other local teams, and won the 2019 River Valley Open championship on Tuesday in Gallia County. The Raiders’ team score of 154, was 88 ahead of Southern in second. Eastern was 14 behind the Tornadoes in third place, while South Gallia was 12 back of EHS and took fourth with 40. Ohio Valley Christian rounded out the five-team field with nine markers. River Valley won 10 events, including all-4 relays races. The Silver and Black also picked up six second place finishes, as well as seven third place finishes. 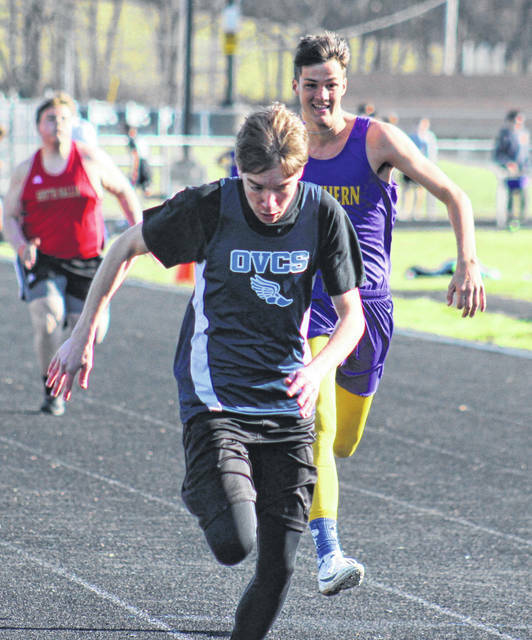 The RVHS relay team of Jared Reese, Cole Young, Nathan Cadle and Trevor Simpson won both the 4x100m and the 4x200m, pacing the field with respective times of 48.2 and 1:49.7. The Raiders’ 4x400m quartet of Simpson, Caleb McKnight, Brandon Call and Rory Twyman posted a winning time of 3:49, while the 4x800m squad of Call, Twyman, McKnight and Dylan Fulks led the way with a time of 9:07. Individually, McKnight was champion of the 400m dash with a time of 57.46, while Call won the 800m run with a time of 2:14.9, 12.1 seconds ahead of Fulks in third. Fulks won the 1600m run with a time of 5:13, 14 seconds ahead of Twyman in third, while Cody Wooten was champion of the 3200m run with a pace of 12:08. Twyman was also third in the high jump, clearing 5-2. RVHS senior Eric Weber won the discus throw with a distance of 136-9, while Darian Peck was in second at 119-8. Peck also came up with a third place finish with a distance of 39-3.25 in the shot put. Raiders senior Ethan Cline won the pole vault by clearing 9-00, while Cadle and Ryan Lollathin placed second and third respectively, both clearing 8-6. Cole Young claimed second in the 100m dash with a time of 12.50 for the Silver and Black, while Reese was runner-up in the 200m dash with a time of 25.23. Nathan Young was second in both the 110m and 300m hurdles with respective times of 19.34 and 48.08, while Noah Patterson was third in 110m hurdles at 20.14, and third in the 300m hurdles at 53.68. Southern claimed four event championships, earned a trio of runner-up finishes, while placing third twice. Trey McNickle was a two-event champion for the Tornadoes, pacing the 100m dash with a time of 12.03, and winning the the long jump with a distance of 18-7.5. Brody Dutton was second in the long jump at 17-2.5, while also finishing second in the high jump by clearing 5-8. SHS sophomore Chase Bailey won the 200m dash with a time of 25.13, .31 ahead of Dutton in third. David Dunfee was champion of the shot put with a distance of 39-9.5, while claiming third in the discus with a throw of 115-6. Weston Thorla was runner-up in the 400m dash with a time of 59.60 for the Purple and Gold. Eastern didn’t claim a gold medal, but had seven second place finishes, to go with one third. 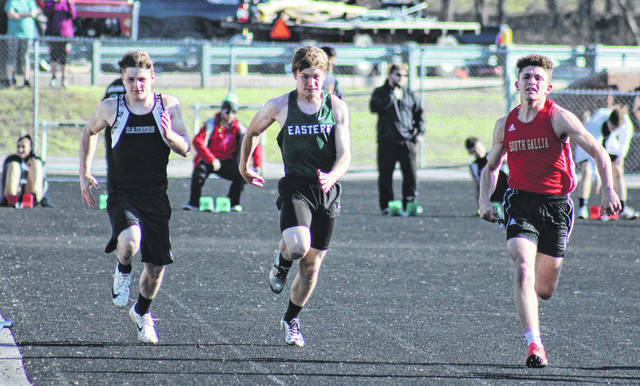 All-4 Eagle relays earned second place, with the 4x100m team of Colton Combs, Noah Browning, Brady Smith and Jayden Evans posting a time of 48.9, just .7 seconds off the Raiders’ pace. The 4x800m team of Combs, Nick Browning, Noah Browning and Bryce Newland turned in a time of 9:08, a single second behind RVHS. The quartet of Combs, Evans, Smith and Michael Letson ran the 4x200m relay in 1:47.1, while the team of Combs, Evans, Nick Browning and Noah Browning ran the 4x400m relay in 3:52. Newland took second in the 1600m run with a time of 5:15 for the Eagles, while Nick Browning was second in the 800m run with a time of 2:15.8. Mason Dishong earned runner-up honors with a distance of 39-4.5 in the shot put, while Letson claimed third in the 400m dash with a time of 1:10.32 for EHS. South Gallia won a trio of events, while earning one silver medal and one bronze. Justin Butler was a two-event champion for the Rebels, running the 110m hurdles in 17.93, while posting a time of 47.66 in the 300m hurdles. Kyle Northup won the high jump for the Red and Gold, clearing 6-00, while Griffin Davis took second in the 3200m run with a time of 14:25. SGHS had one relay team, with the quartet of Gavin Bevan, Justin Butler, Kyle Northup and Greg Davis taking third in the 4x400m with a time of 4:18. The OVCS boys were led by a pair of third place finishes, with Trevor Blank running the 100m dash in 12.2, and Andrew Dubs leaping 17-2.5 in the long jump. Visit www.baumspage.com for complete results of the 2019 River Valley Open.